Pinewood derby cars are serious business. Last month it was pinewood derby time for my son’s Cub Scout pack. I was so excited I couldn’t stand it. I remember my Dad helping me when I was a scout. Now I could pass down the long standing losing tradition to my son. We didn’t really lose so much as we didn’t win. I really don’t know what that means, but that’s what my Dad used to tell me and it really does sound better. Things have changed in the thirty plus years since I was a scout. Now we have packaged plans, pre-carved kits, specially designed weights, aerodynamic paints, axle optimizers, special lubricants and, of course, The INTERNET. The pack provided the kits for the boys (a block of wood, four nails, four axles, four official wheels and a copy of the rules) for free — free. This is great, I thought, we can spend quality time together and it won’t cost me anything. After we received our kit it was straight to the Internet. 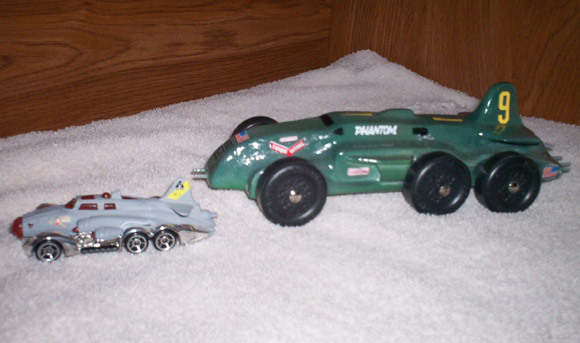 An initial Google search for “pinewood derby” returned 589,000 listings. Included were sites such as: maximum-velocity.com, lowerfriction.com (maximum-velocity and lowerfriction — yeah I was a little worried about those too), derbydominator.com, pinewoodextreme.com, and pinewoodpro.com. PinewoodPRO? Come on, are there really pinewood derby PROs???? When I visited his site and saw what he was charging for tips I came to the conclusion that he did fit the definition of a pro. There is actually a page from Stanford University that explains “The Physics of the Pinewood Derby”. Oh, and one of my favorites, pinewoodprofessor.com (I’m guessing he got his PhD from Stanford). The professor says “Be Smart! Use Science and Physics to Make The Fastest Pinewood Derby Car Possible!” The professor offers a “new cutting edge DVD” (just $14.99 plus $5.01 S&H) to help you do that. Did I say it wouldn’t cost me anything? We don’t need no stinking DVD! We had about a month and a half before race day to build our winning car so I had to narrow the list. 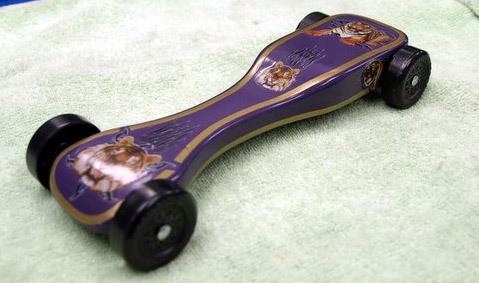 I typed in: “guaranteed winning pinewood derby car” (sounded logical). This search returned 17,400 listings. Still too many for our time frame, so I typed in: “pinewood derby cars that will allow you to say in your face to the other dads”. Jackpot! This search returned only two listings. A quick check of these sites found we could spend from $6.00 for plans to $109.90 for all-inclusive kits. We don’t need no stinking plans! We would just find a car design we liked and re- create it. After two weeks of looking at car designs we finally choose a smoking hot one. Now we just had to draw the design, transfer it to the block, and cut it out — simple. Problem: this design has fenders, Our block does not. No problem: after we cut out our basic car shape we will simply glue some extra wood on for fenders. We transferred the design. Problem: in order for the fenders to match up, our design called for the wheelbase to be different than the stock block. I checked the rules; nothing in there said we could not change the wheelbase. Some of the Internet sites said you couldn’t. A quick call to the scout leader for confirmation, and we moved the wheelbase. Then we cut it out. Now we just had to cut the fenders and glue them on. Problem: the fenders proved to be too high for the block we just cut. It was off to the hobby shop to buy a new stock block (only $4.00, not bad). While we were at the hobby shop we checked out other supplies. They had some interesting weights. According to the rules the cars may weigh up to 7 ounces. Back in my day my Dad and I melted lead weight into our cars. Yes, I said lead. Kind of explains a lot, doesn’t it? I decided we would use some of these hobby store weights instead. I mean it wouldn’t do anything to bring back my brain cells but it might benefit my son. We went ahead and bought weights in anticipation ($8.00). Did I say it wouldn’t cost me anything? When we got back we added extra wood for the height of the car and the fenders, transferred the design, and cut it out again. Now, time for sanding. Problem: the rotary tool was dead. Believe me when I tell you that “back in my day we didn’t have any fancy rotary tools; we just used a block and some sandpaper”. Did not work. Okay, we will buy a new one ($57.00). Did I say it wouldn’t cost me anything? After sanding it was time for painting and attaching the axles and wheels. It looked great. We put it down for a test “drive”. Problem: only three of the wheels were touching the ground. A quick Internet search and I discovered (from the pinewood pro, no less): “Free speed tip: Friction can actually be eliminated! (eliminate friction? No wonder this guy is a pro) How? By removing the surface that is causing the friction. In our speed section titled ‘Triple Trouble’ we tell you how to eliminate friction by lifting one of the front wheels so it doesn’t touch the track at all. Your car is rolling on only three wheels, thereby eliminating friction from one wheel!” Okay, I’m not going to sweat the three-wheel thing. Call it a happy accident. Now we had to add weights to get us right at the 7-ounce limit. I do not have a scale to weigh 7 ounces. The post office does. We took the car to the post office. Ten ounces. I’m glad we bought those $8.00 weights. So we brought it back and drilled a bunch of wood out of the bottom. We went back to the post office. I weighed it again. Nine ounces. Let me just apologize now to the person behind me that was trying to get me to hurry when I shouted, “Back off lady, I’m weighing my car here!” Sorry. It was obvious to me that the post office was not the best way to check the weight of the car. I bought a kitchen scale ($14.00). Now we can drill and weigh until we get it right. We got it right. 7 ounces. My $14.00 scale is not really as accurate as the post office so I wasn’t convinced. Back to the post office to weigh again (sorry again lady). We were slightly over so we drilled out some more. One more trip to the post office and we were good. Just under $100.00 in supplies and tools and a month and a half in prep time and we were finally ready. Tomorrow is race day. We show up at the race site. Outside I see fathers and sons with power tools making last minute adjustments to their cars. One guy’s car was like 16 ounces. He should have gone to the post office. Our weight was right on so we helped the guy with the heavy car. I held it while he drilled. Just before the race he had it down to weight and even patched and painted over the holes. It was race time!!!! Let me just say that the “three-wheel eliminate friction” thing: not so much. Between races they allowed you to re-lubricate. My son got so happy with the graphite that if they re-weighed us we probably would have come in at 10 ounces again. The guy we helped with his car, yeah, he came in first. We won the “Dreaming Award”. I’m not sure what that means, but I do know that I am dreaming about next year. I’m also thinking about getting a sponsor, so if you know anyone who works at Home Depot or DeWalt maybe you can have them give me a call. Columnist Chris Joker is a single father of two, and editor of Family Pastime Magazine. My son’s car features real working lights and was completely legal. I took him down to our local police station where we dedicated it to the chief of police before the big race day. The newspaper was there and he had lots of fun with the car, which placed third. This is my son’s pinewood derby entry, the car ran very well but didn’t win due to a fluke in the race timing. We are proud of how well the car ran nonetheless. 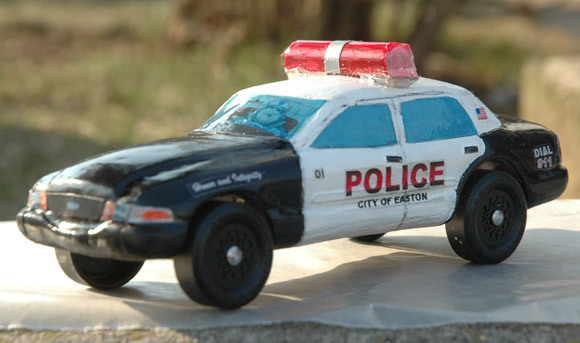 The idea for this car came from my son’s collection of hot wheels, and the cars that have been in your newsletter. My son and I have won lots of races. This year my wife asked me to build a car that looked very cool, but wouldn’t get first place (she says I’m too competitive). So to please her I built this B-52 bomber, nicknamed the “Buff”. Airmen that flew the B-52 called her the Buff cause it was big like a buffalo. The car is not too fast; it came in fourth in the pinewood derby last weekend. We bus a lot of kids in from the surrounding neighborhoods to our church, so I help many of them cut our their cars. A couple of years ago I must have cut out 125 cars or so and was getting a little exhausted. It seemed like I was falling behind my deadline to get them done. The theme for that year was anything to do with food. Some kids hadn’t even turned in their plans yet, and other kids were only able to come every other week due to mom and dad being divorced. I decided to make a few extra cars for any of the participants that wanted a basic car. I proceeded to cut out a half dozen wedge cars with large and small drill dimples to simulate Swiss cheese. The kids loved them. We have about eight different classes at our event so that kids race against their own age groups. We also have a leader class, an adult class, and a senior class (over 55). One of our adults, Lauren (18), has Downs Syndrome, and since her little sister and mom were making cars she decided that she wanted to participate also. She picked up one of the Swiss cheese cars and took it home to work on it. Well, when race day came, in came Lauren with her cheese car all painted in a nice yellow; but she had added something to it. She had taken a furry toy mouse and cut it in half. She stuck the upper body on top as if it was coming out of the cheese, and stuck the lower half out the back. It was quite a sight, and everyone thought it was very humorous. During the race event, every time the mouse car was put on the track the kids would chant, “mouse, mouse, mouse.” I would look at Lauren when the kids were shouting, and she would have her head down since she was very shy. 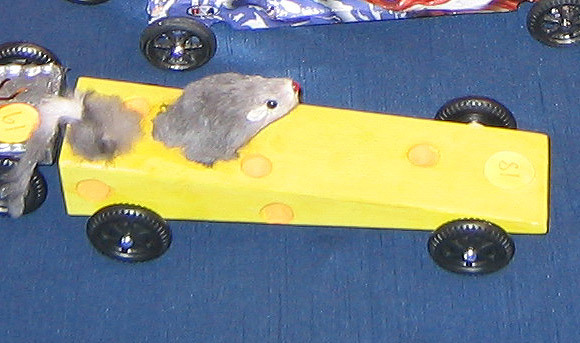 As the race proceeded, it was obvious that the little mouse was doing really well against the other cars in its class. During the race there was an intermission, and the cars that won a trophy for first, second and third in show were announced for all the age groups. I heard, “For the adult class, first place goes to Lauren for the Mouse car.” Wow, that really touched my heart that she got first place out of the adult class in show. The race continued and the heats were tallied. As they announced the winners for the categories I eagerly listened for my name, (as we all do). Third place and second place were read. When they got to first place for the adult class, the room erupted as Lauren’s name was read. She shyly went over and received her trophy. After we cleaned up we realized that Lauren had forgotten her trophy. The next morning when I saw her at church, I handed her the trophy. Later that morning I glanced at her sitting in the pew and saw her polishing her first place trophy — just gently rubbing the fingerprints off I suppose. To me it made the whole season worth it. Can you explain to me what a “rail-rider” is? Rail-riding is an alignment technique that presupposes that the track will never be perfectly level. Therefore, no matter how perfect you make your alignment, the car will contact the guide rail more than one time. When it does, it will contact two wheels on one side of the car, and then it may also contact the other side as well. Doesn’t touch the raised wheel. So, if the left-front wheel is raised, then the right-front of the car is narrowed slightly, and the car is steered slightly towards the center guide rail. With good rear wheel alignment, the car will only contact the guide rail with the right-front wheel. Our track has side guides. How is the setup different? The set up is generally the same on the side-guide track except that if you have a raised wheel, set the alignment to drift away from the raised wheel (instead of towards the raised wheel as on a center-guide track). This keeps the raised wheel from touching the side guide. Also, if allowed in your race smooth the sidewall of the wheel to minimize speed loss when the wheel touches the side guide.